Galleria as Greenhouse: Could It Work Here? I really hate malls, which is one reason I love this idea. 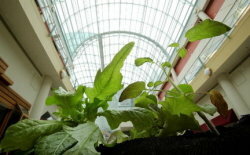 Now Vicky Poole, the Galleria's marketing and events director, who worked on her grandpa's farm as a child, expects that by late spring or early summer, there will be fresh tomatoes for sale among the shops and galleries at the downtown Cleveland mall. Very fresh -- as in vine-grown in bags and troughs hanging from steel stair banisters and ceiling beams in the shopping center that stretches between East Ninth and East 12th streets.